On a little farm in West Sussex, a stone’s throw away from the village of Henfield, sits a delightful B&B shielding a humongous surprise behind its romantic private garden. Not the collection of hairy, speckled piggies that run to oinkily greet you as you pass through the oak woods or the chickens who welcome you with a chorus of clucks but a long winding path that opens out onto six acres of breath-taking English prairie humming with harmonious colour. 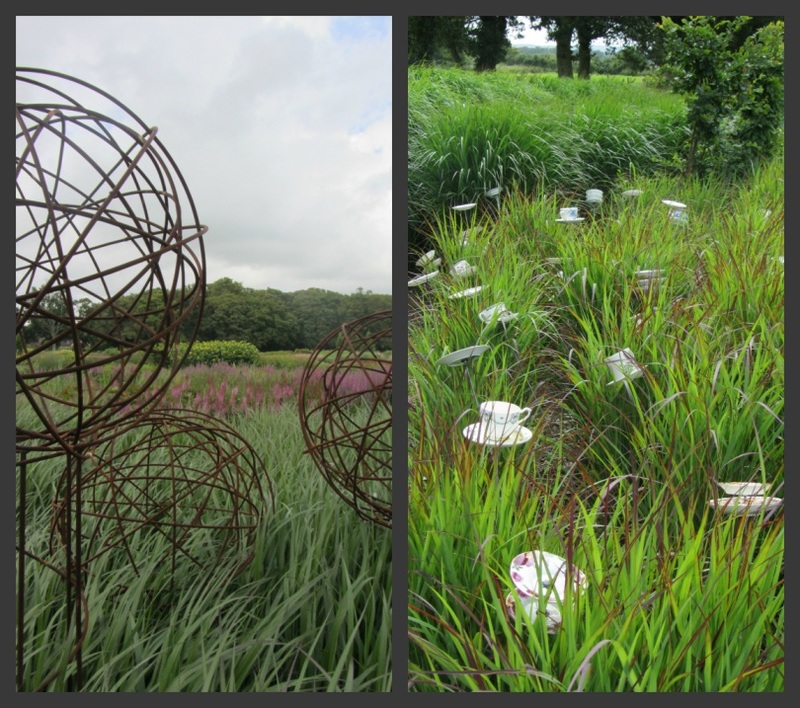 Welcome to Sussex Prairies Garden. Laid out in a Fibonacci-esque spiral fashion you are encouraged to escape the formal green paths and enter the network of hidden trails within the borders. 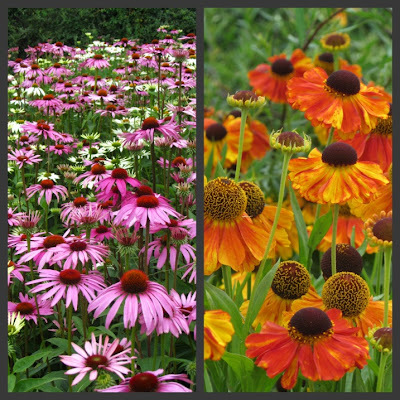 The reward is to walk amongst tall perennials and billowing grasses to be at one with plant, bee and butterfly, absorbing the sights, sounds, smells and textures at first hand. The owners and designers Paul & Pauline McBride have created a unique relaxed experience here for visitors to the garden. Returning to West Sussex in 2009 after working on large projects in Luxembourg and also alongside naturalistic landscape and garden designer Piet Oudolf, the couple took on the incredible project of transforming the six acres of farmland into the Sussex Prairies Garden. Nothing is done in half measures here, layer upon layer of great stonking strokes of colour and texture allow you really focus on the plants merits without distraction. With over 30,000 plants to choose from, the paths sing with the sound of insects feasting on the smorgasbord of rainbow nectar served daily throughout the summer. The hub of the garden is a barn of a building festooned with pretty vintage bunting serving delicious mummy made cakes alongside exquisite coffee. 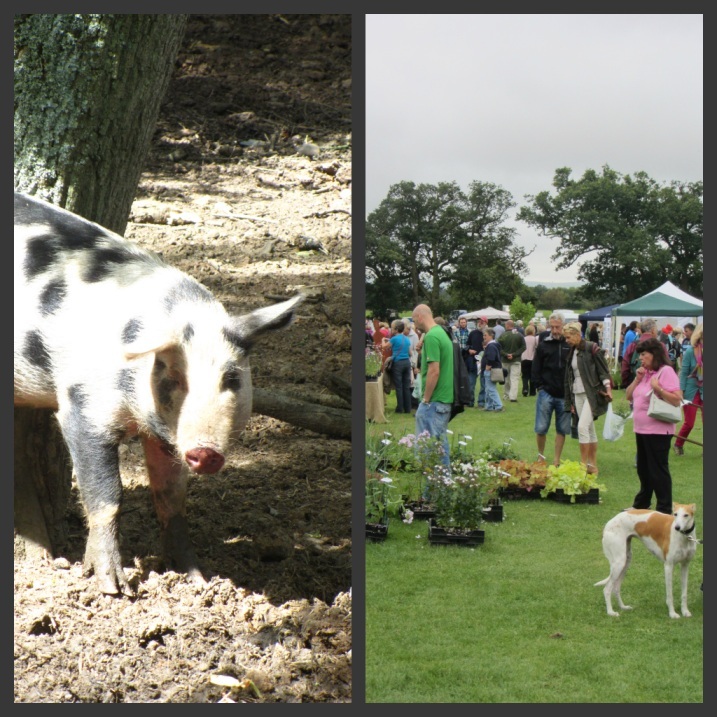 This weekend was our second visit of late which saw a lively plant, art and craft fair attracted huge numbers of plant lovers and hunters cramming trollies, bags, pockets and hats with every conceivable must-grow they could lay their green fingers on! we have buffalo AND coneflower...please come visit! Your last comment made me LOL! We obviously share the same childhood memories!! The garden of the B&B looks amazing. Wish mine looked like that! We do admire the bravura of this planting style and the beguiling range of plant material used to create the oceans of colour and texture, but, [and we hesitate to add a but]this is really not at all for us. We should, we know, yearn to add permanent structure, to restrain, to hold tight, to contain as well as allow freedom of flowering. We should wish to control the eye, to narrow the focus, to create vistas, narrow views and eye catchers rather than 'go with the flow'. 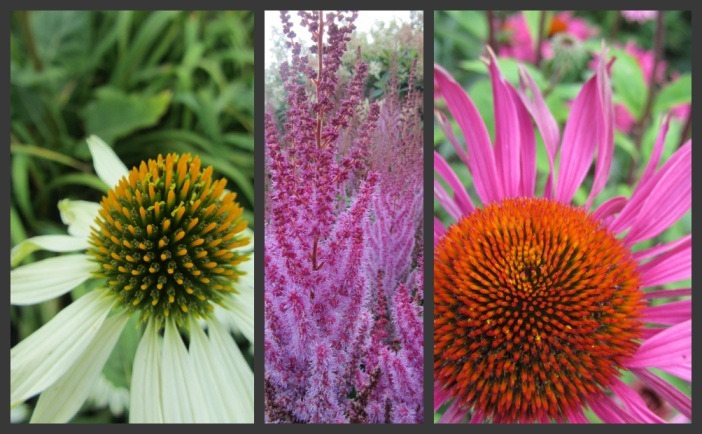 Still, as we always say, it all adds to the spice of life that we all like and do different things.Gardens certainly can have as many variations as the personalities of their owners and that is what makes it all so exciting. Hi Paul, it looks like a magical place, thank you for the introduction. Your photographs are beautiful as always. Wonderful selection of gardens you keep showing Paul. This one is dreamy with those amazing drifts of soft colours - stunning is the word. What a delightful post and anything that uses the fibonacci method would have me hooked from the start. I love the whimsy of the teacups and orbs. Spectacular. Oh I enjoyed this so much, and your final line, made me laugh out loud. Delightful. Are these in bloom in Sussex right now? I know you don't have hummingbirds (so told) but if you did, those Verbena bonariensis would set their hearts a flutter, as well as many of the other plants (crazy for monarda they are but ours is just about finished!). The tea cups are clever..and the iron orbital sculptures work perfectly don't they. Photo number four, are you able to identify that for me please? As always, a great share. Thank you Paul. I wish we did have Hummingbirds here in the Uk Bren, I also find them fascinating. I believe plant number four is a Buttonbush(Cephalanthus occidentalis)so pretty isn't it. Very popular with the butterflies. Thank you Paul. It is unfamiliar to me, very pretty indeed. Think it might survive our zone, and it seems to be found in the wild in another of our Maritime provinces. Will look for it. Such a lush and colorful garden. 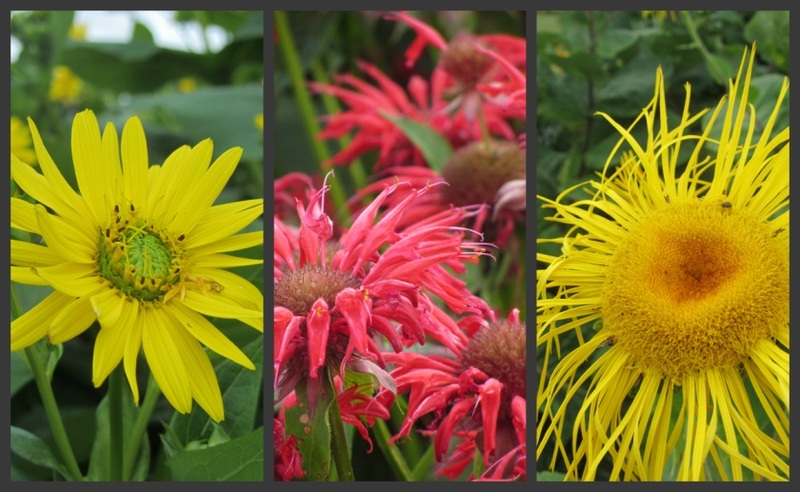 Every pathway makes one discover different varieties of flowers. I'm fascinated by the hanging teacups and saucers. How did they hang them like that? They look like they are floating. It looks more like Alice In Wonderland than Little House in The Prairie. Have a fun week Paul. Yes, eat your heart out, Nellie Olsen! And what "stonking strokes of colour" and prairie pleasures there are here! I am still astonished how you find all these lovely places! But I am certainly not complaining... no, keep'em coming, we just LOVE being swept off to all these green havens, and guided by Mr Paul himself, his camera and his glorious fountain of worthy wordings! I particularly love the two photos just before the pig photo. The many layers of colours and texture are just stunning! Piggy Oinkson is SO sweet, with his/her ears flopping in all directions...! Gorgeous weather here in Wiltshire today, and I see that the London area is even warmer - hope you can find the time to enjoy summer, now that is is finally here! Love that shot next to the butterfly, magical. Quite beautiful Paul....those teacups and saucers scattered through the grasses...how charming and whimsical! It is nice to see plants massed like this. What is that saying? Go big or go home! 6 acres is a ton of work. The McBrides garden is beautiful so this has to be a labor of love. Wow, that's fantastic! Thanks for sharing such great photographs of this wonderful place. Quite a sight! What a wonderful B&B and garden. I love perennials and spotted piggies! A fun place for a fair!! Laura Ingalls would have loved this. I cannot believe all the amazing plants. I love the tea cups too. Always your photos are so lovely! I wish we had fairs like this! Could you be bothered to tell me the variety of globe thistle pictured above? I cannot seem to find its match. Thank you. I think it may be Echinops ritro 'Veitchs Blue' just before flowering, so the blue hasn't come through yet. If you are looking for a paler version Echinops bannaticus 'Star dust' is worth looking at.